Dr. Gupta is Deputy Director of the Johns Hopkins (JH) Center for Clinical Global Health Education (CCGHE), and Associate Professor of Infectious Diseases at the JH School of Medicine, with a joint appointment in International Health at the JH Bloomberg School of Public Health. Board certified by the American Board of Internal Medicine in infectious diseases, Dr. Gupta specializes in international public health, clinical research, and education in infectious diseases, HIV/AIDS, and tuberculosis (TB). Since 2002, her work has been focused primarily on India, where she leads several Indo-JHU research collaborations, including the C-TRIUMPH and RePORT consortium for tuberculosis (TB) research funded by the US National Institutes of Health (NIH) and the government of India. 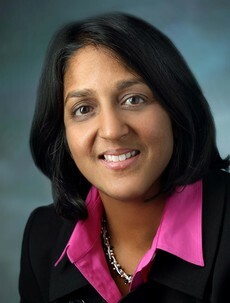 Dr. Gupta is also Co-principal Investigator of the NIH-funded Baltimore-Washington-India (BWI) HIV and Infectious Diseases Clinical Trials Unit (CTU), and she is an active clinical investigator in multi-country HIV/TB trials conducted by the AIDS Clinical Trials Group (ACTG) and the International Maternal Pediatric Adolescent AIDS Trials Network (IMPAACT). Additionally, she has been awarded research grants from the NIH, CDC, and several philanthropic foundations to investigate TB in children and pregnant women, malnutrition, infection and inflammation, HIV treatment outcomes, and antibiotic resistance. Dr. Gupta is an author of more than 90 peer-reviewed research publications and 7 book chapters, primarily on prevention and treatment of HIV, TB, and other infectious diseases, predominantly in low- and middle-income settings. She has also mentored more than 30 junior scientists in India and the US to run research studies and submit their own scientific findings to peer-reviewed publications. From 2000–2002, Dr. Gupta worked for the US Centers for Disease Control and Prevention (CDC), where she was engaged in global public health projects in the US, Guatemala, Vietnam, and Micronesia. Dr. Gupta received an undergraduate degree from MIT, a Doctor of Medicine from Harvard Medical School, and a Master of Health Sciences in clinical investigation from JH Bloomberg School of Public Health. She completed her internal medicine training at San Francisco General Hospital-University of California, San Francisco, followed by a post-doctoral fellowships with the Epidemic Intelligence Service at the US Centers for Disease Control and Prevention and at the JHU School of Medicine.